As seen in "MythBusters: Cooling a Six-Pack"
Explanation: MythBusters Kari Byron, Tory Belleci and Scottie Chapman recreated history when they tested whether an ancient urn found in Baghdad could've been used as some sort of battery. 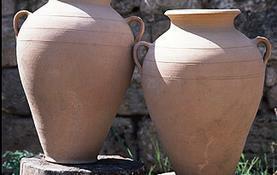 Discovered in the 1930s, the urn dated back to sometime between 250 B.C. and A.D. 250, long before modern batteries were invented in the 19th century. The artifact contained a copper pipe with an iron rod in its center - which could've served as the battery's electrodes - and had an asphalt cork at the top. Still inside the urn was the residue of an acidic liquid that could've provided the electrolyte element to bring the battery to life. The MythBusters fashioned 10 terracotta replicas of the mysterious urn, complete with lemon juice as the electrolyte agent. The batteries stunk as standalones, barely mustering up 0.5 volts of electricity apiece. However, the team hooked the 10 primitive batteries together, and the resulting mega-battery registered around 4.5 volts, generating enough buzz to deem the myth plausible. Compared to modern batteries, the voltage is pretty wimpy, but for the ancient world, it would've been a shocker.